In 1947, two years after the end of World War II, a bizarre event occurred that would shock the United States of America. According to eye witnesses and testimony an unidentified flying object, dubbed UFO, crash landed in Roswell. The crash occured a few short miles from the local airforce base which happened to be home to a bombing wing that housed nuclear materials. It was publically revealed in the local newspaper, Roswell Daily Record, that a flying saucer crashed in the desert outside of town and that the object was found on a ranch by a local named William Brazel. After Brazel and his family began to pick up the debries from the crash, the local military sent in Major Marcel who famously took a picture holding pieces of the crash debris. Following these accounts the newspaper published an article that a flying disk had crashed and been recovered by the Airforce, unfortunately a few hours later this was countermanded by General Ramsey who notoriously stated that it was a weather ballon. This would spawn almost a century long struggle between Ufologists and the Military over the origins of the crash. The latest report is that the crash at Roswell was a top-secret project known as Mogul. Mogul was rumored to be a high altitude weather ballon and the one that crashed at Roswell was one of many that was sent out in the late 40s and early 50s which if the Airforce is to be believed could be the origins of the flying saucer craze during this period of American history. However, in my opinion, the military is not to be believed in this case. Mogul might have been real, but it can't explain thousands of unexplained sightings and numerous military review panels to investigate them, some public, some secret. The most famous public review panel setup by the airforce was Project Bluebook, but something stranger was lurking in the shadows. It was a secret committee designed to investigate rumors of alien spacecraft and implement plans to retrieve any crashed UFO's. The panel, was named the Majestic 12. The panel was alledgedly formed in 1947, months after the Roswell crash, originally to investigate the Roswell crash and if sources are to be believed it continued long after the original crash and was directly involved with the retrieval of additional downed UFO's across the United States. Several documents were discovered in U.S. archives refering to MJ-12, Majestic 12, and MJ TWELVE. These documents were found by Ufologists investigating Roswell and numerous other cases of unexplained alien activity. 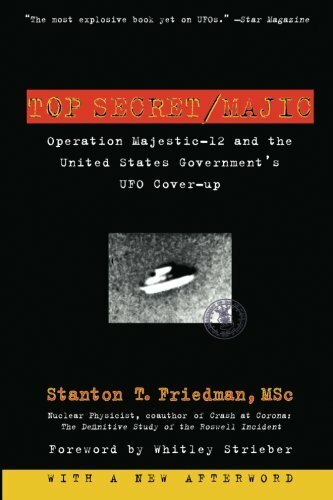 All of the documents seem to point to the creation of a top-secret presidential committee formed by Harry Truman following the Roswell incident with the primary purpose to hide alien encounters from the American public in the days after Roswell and to suppress the truth from reaching the media about these encounters for it would surely shatter almost everything in American culture if it was to come to light. These twelve men were military leaders, scientists, advisors, and high ranking government officials handpicked by the military-industrial complex to hide the nature of alien beings from the public. Unfortunately, documents such as the MJ-12 documents seem too good to be true. In all likely hood they probably are too good to be true, but that doesn't mean there isn't a kernal of truth in them. The FBI investigated the matter in 1988 and found that it was a hoax, but there are strange occurances within the story, despite attempts at forgery and fakes. Two Ufologists at the center of the story are Bill Moore and Jaime Shandera who discovered several MJ-12 documents. There is even rumors that Moore attempted to fake some of them to encourage others in government to speak up about alien activities. Despite this there have been reports of cryptic messages leading the investigators to finding additional MJ-12 documents, most disputed as forgeries. But, there are countless other documents found by individuals who were not Moore or Shandera that reference a committee named MJ-12. The story is endless and I may do a follow up on this, but there is no clear answer to any of it. If Roswell happened the way that Ufologists said it did, in that there was a crashed alien spaceship, then wouldn't it make sense for the government to try and hide this from the public? How would they go about it? Well they would form a group to suppress information and hide the truth that is what the MJ-12 represents in this story. On the flip side, it may have been a weather ballon. This ballon could have been constriued as a saucer and spawned pop culture and movies to create the "Saucer Craze". This alone could have captivated the attention of young boys who grew up during this period to desire a truth about UFO's because they didn't want to believe the truth the Airforce gave them, even it if was real. Wouldn't it make sense for them to forge documents indicating that there was something to the story?